We've all been there: waiting for a set to come when a standout approaches, waaayyy past the break. Everyone paddles frantically to beat the looming destruction, but sometimes it's just too far and you find yourself going backwards over the falls, taking a behemoth on the head, or trying to duck dive six feet of whitewater. Either way, it's a losing battle. 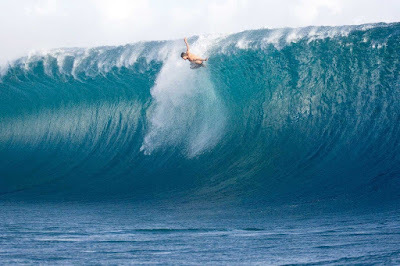 Don't panic: Surfing is dangerous and waves can be unpredictable. Still, staying calm will allow you to assess each situation with a clear mind, and prepare to escape accordingly. You will also save energy you would otherwise waste trying to fight a losing battle against the power of the sea...energy better used for swimming to safety after the wave has passed. Take a good breath: If you see a standout approaching and know you're going to get mauled, take a deep breath and hold on! If I'm paddling out on a particularly big day, sometimes I'll take a lot of deep breaths to stretch my lungs. (Here's a good post on increasing your lung capacity.) Also remember that you can probably hold your breath longer than you think, so when your body is tempted to panic, don't! Hang on to your board if you can: Floating is always good, right?! If you can hang on to your board through the washing machine, do it. It'll keep you closer to the surface, which always means safety. Let the wave pass: Don't go all Gandalf on the ocean...let it pass! Curl up and let the washing machine do what it wishes. You'll be surprised at how quickly it passes, and also save energy for your ascension. Climb your leash (if you have to): If you get so thrashed that you don't know which way is up, reach for your leash and start climbing. The board is floating and will lead you to safety. Prepare for the next wave: You may have been thrashed by the first wave in a set of three behemoths plowing through the lineup. Be ready for this by taking a deep breath first, and then checking for what's ahead. If the shadow of another wave looms overhead, dive deep and go back to step 3. Don't panic! : This is here twice because it's that important!